When I received an invitation to dine at the relatively newly reopened The Federalist in DC, I honestly wasn't sure if I wanted to say yes. Here's the thing: whenever I travel and stay in hotels, I rarely eat at the hotel restaurants. Instead, I prefer to check out free-standing restaurants; they somehow seem more authentic. But then I've really liked some of the hotel restaurants in my own city: Urbana, Blue Duck, and Brabo, just to name a few. So why not try one more? I said yes! The Federalist is focused on resurrecting the culinary traditions of the Mid-Atlantic region. By exploring the food culture of a blossoming nation, we have created a restaurant menu that is inspired by 18th century American food lovers and executed through local Washington, D.C. producers and purveyors. The menu features heirloom varietal vegetables and dishes inspired by the early American-European union, as well as the flavors of the vibrant spice route. 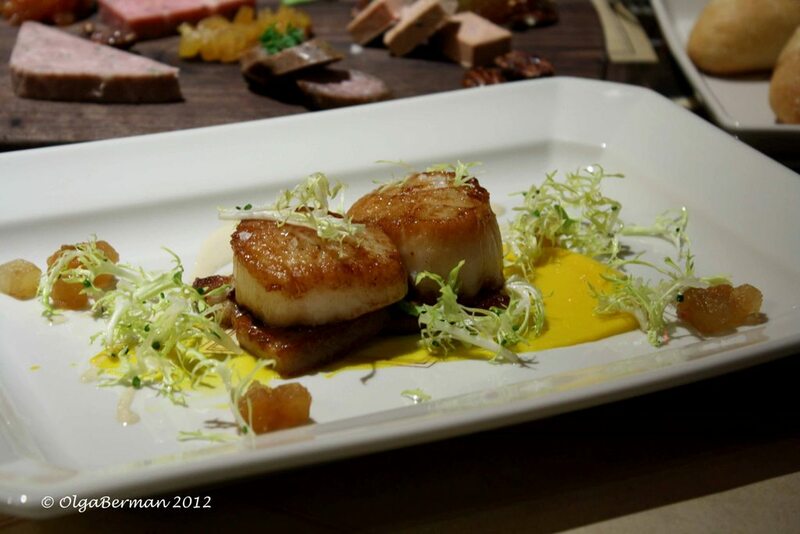 Our focus is preparing thoughtful yet accessible cuisine. My dining companion was Andressa, who does PR for Destination Hotels & Resorts. Luckily, she was charming and chatty, and so it wasn't awkward sharing a meal with someone I had just met. The dinner menu had everything from beet salad to chicken roulade to roasted Atlantic cod, not to mention soups and appetizers. I admit I had a very hard time making my selection. Again, I was in luck: Andressa was willing to share food for tasting and suggested we order a few extra things from the kitchen so that I could sample a larger variety of dishes. I was game. As I drank my French martini, our incredibly knowledgeable waiter, Joe, told us about his favorites on the menu. His colorful descriptions of the dishes, however, made the decision even harder! 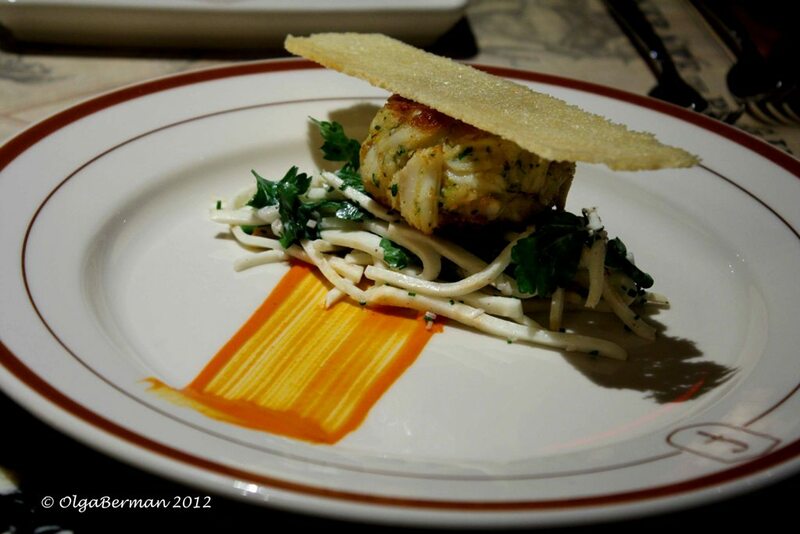 Jumbo Lump Crab Cake served with celery root slaw, Romesco sauce and brioche tuile. When the dish was brought out, the first thing I noticed was the bright orange of the Romesco sauce. It wasn't just pretty--it also gave a nice punch to the dish. The crab cake fell apart when we tried to cut it in half, which is a great thing: it means there was very little filler in it. It was almost all crab! The celery root slaw was crunchy and well-seasoned. For my own appetizer, I had Rappahannnock Stingray Oysters served with French Breakfast Radish and a Long Pepper Mignonette. These oysters came from a river that's half fresh water and half salt water, giving the oysters a very fresh taste. I've never had oysters topped with radish before, but I really liked this idea. It added some sharpness, but not as much as a horseradish would. I just wish the oysters were better removed from the shell before they were served; I had to use my fork on a few of them )not a big deal). We also ordered a few Rhode Island Diver Scallops to try. These were served with braised bacon, Hubbard squash, compressed apples, frisee and brown butter. The puree of Hubbard squash was perfectly smooth with a slight sweetness to it. I think The Federalist should offer it in a soup bowl! The scallops were cooked through, but not chewy, and went great with the saltiness of the bacon and the sweetness of the apples. Andressa ordered a Charcuterie Board which included a selection of house made charcuterie, mustards and jams. My favorite was the chicken pate, which tasted like it had a bit of goat cheese mixed into it. I'm not sure if this was the case, though. By the time my entree came, I didn't have very much room. Maybe it was a good thing. 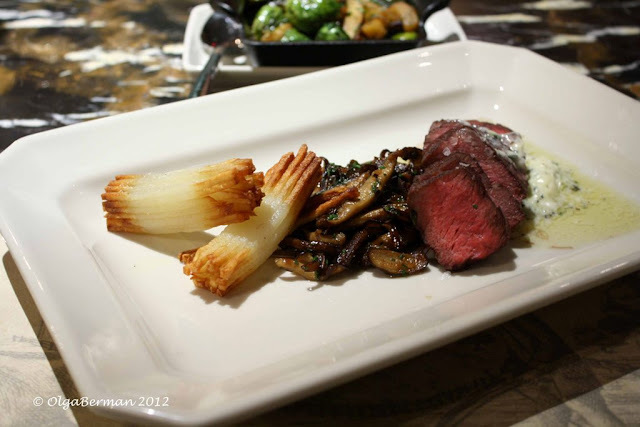 My Martin's Beef Flatiron served with wild mushroom fricassee, pommes alumette and herb butter was disappointing. The meat was tough, the potatoes were undercooked, and the mushrooms were incredibly oily. After a few bites I was done and declined to take the leftovers home. Andressa's Ale Braised Martin's Beef Short Rib, served with kohlrabi, Swiss chard and onion mostarda, was a thousand times better! I just wish the presentation was a bit more refined. I don't have a photograph because all you could see was a big chunk of beef, but it was a well flavored and tender piece of beef. I know because Andressa shared! And then we were talked into ordering dessert. We easily said yes...must have been that red wine talking we had with our entrees. Andressa ordered Lemon Verbina Panna Cotta with a honeyed amaranth bar, and roasted pineapple and lime-espelette granita. I had a bite of the panna cotta and it was lovely--mild flavored, smooth and incredibly refreshing. I went for something a bit more decadent. Ok, a lot more decadent: Valrhona Hot Chocolate with a fresh yeast doughnut and house made marshmallows. 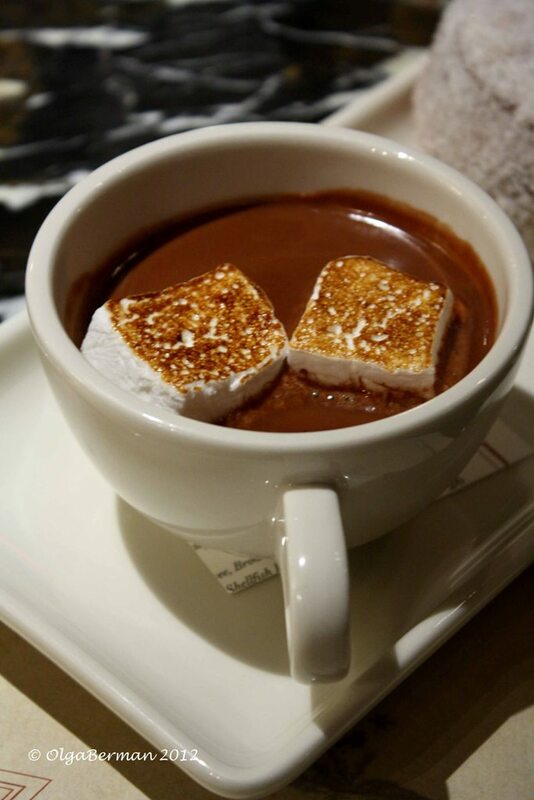 My favorite part of the dessert was the rich hot chocolate with the homemade marshmallows. I could probably have it daily. Of course, then I would not fit into any of my clothes. Although I did enjoy dunking the doughnut hole into the chocolate, I could not eat the rest of the doughnut. I suggest the Federalist serve this dish with doughnut holes: cuter, easier to eat and great for sharing with friends. Overall, it was a delicious meal. I would recommend checking out The Federalist for its drinks and appetizers. They also have a gorgeous semi-private room that's decorated in everything orange. My sister would flip over it: she has the biggest crush on the color orange. It would be ideal for showers or intimate dinners. Disclosure: my meal was courtesy of The Federalist. However, I was not under any obligation to write about the restaurant, nor paid to do so. PS Prior to dining at The Federalist, I noticed that their online menu was missing prices. I mentioned it to Andressa, and the issue has been fixed!! PPS We also shared a side of Seared Brussel Sprouts served with house made jowl bacon and Toigo apples. They were incredible reheated for breakfast the next morning. Gorgeous food, I would love a mug of that hot chocolate with marshmallows! jealous! might have to check that place out - im in dc! You always have such interesting food posts. I love the presentation of the foods from The Federalist. I think the hot chocolate would be awesome, with it's homemade marshmallows. Yum, Yum!! Oh God! That hot chocolate looks to-die-for.